It is pretty incredible that despite a severe shortage of new homes on the market, homes sales went up for the second month in a row in the real estate market in Byron GA. However, with just 1+ month of houses to pick from, new inventory is definitely needed if this market is going to continue its hot streak. This is a good opportunity for homeowners to list their property, get it seen, and potentially sold right now. With so few homes to pick from, nearly every available property is getting long looks from consumers. Real estate agents in Byron GA continue to do their very best to help their clients, showing every available home, and writing contracts as quickly as buyers and investors commit to purchasing that house. 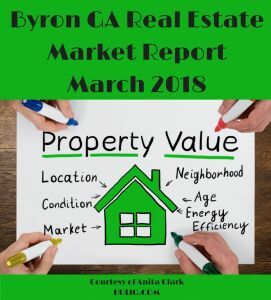 If you are not sure about entering the Byron GA real estate market, this market review may help change your mind! Currently, there are 42 houses for sale in Byron GA. The highest priced listing in this market is currently available at $349,900 and the lowest is only $34,900. Square footage of available properties ranges from 1,186 feet up to 3,602. Also, there are homes available in numerous price points to meet the needs of all real estate buyers. Buyers and investors who are looking for a fixer-upper have only 2 distressed properties to pick from this month. Unfortunately for sellers, there has been a slight increase in foreclosure and/or short sale homes in the past quarter which can affect appraisals and future sales prices. The highest priced home for sale in Byron is a home located at 15 Courtney Drive. Available for $349,900, this 3.56K+ square foot home has 4 bedrooms, 4 bathrooms, and a host of amenities worth checking out. Currently, there are 26 Byron homes that are pending sale. This represents a 3 home increase over the previous month. Of these 26 houses, 1 is distressed. This market is fighting back after a recent slowdown. With an influx of new inventory, it could rebound even faster. Time will tell how this market tilts in the coming months. There was a total of 29 home sales in Byron GA during last month. This represents the third highest number of monthly sales in the past year (the annual average this past year is 25 sales). The average sale price for these homes that closed last month was $164K+ and they took an average of 34 days to sell! The 12-month average for both of these categories is $153K+ and 47 days. Clearly, consumers found properties in the lower price points to their liking this past month. The average days on the market was unremarkable this past month and is a reminder to sellers to ensure they continue to market price their home if they want buyers to take interest. The sales price to list price ratio last month was 98.58%, slightly better than the 12-month average of 98.36%. When their homes are market priced, sellers are reaping the rewards. The most expensive home sale in Byron real estate last month sold for $251,400. The lowest priced sale was $38,000. In addition, 2 of the closings this past month were distressed homes, which may have a slight impact on appraisal values in the affected neighborhood for the remainder of the year. This Byron GA real estate market report for March 2018 was provided by Anita Clark. Anita is a licensed residential real estate agent in Byron GA with Coldwell Banker SSK, Realtors.